Ireland's food story is constantly evolving. Young talent are busy breathing fresh energy into the Irish food scene while many very experienced and dedicated food writers, chefs and restaurateurs are still going strong and riding the wave of this invigorated sector. Curious as to who is shaping the way we eat? Meet 20 of the most influential movers and shakers of Irish food today. Chef Aidan McGrath and his partner Kate Sweeney made history this month when their gastropub, Co Clare's Wild Honey Inn, became Ireland's first pub to win a Michelin star. Aidan did the fine-dining thing for many years before taking on Lisdoonvarna's historic Victorian inn. Expect what the Michelin Guide described as "robust and confident cooking" in a comfortable, cosy setting. Food-obsessed pals Aisling and Luca are the mom and pop of The Fumbally, a Dublin 8 cafe and adjoining Fumbally Stables space which hosts eclectic events like yoga brunches, fermentation workshops and movie nights. Fumbally alumni include Katie Sanderson (White Mausu street food) and Keith Coleman (Fia), who features in their upcoming Eat:Ith dinner on October 21. Food stylist and consultant Ali Dunworth has her fingers in some tasty pies, working with Bodytonic's Trevor O'Shea to foster Dublin's food-truck culture at Eatyard and our appetite for all things barbecue at the annual Big Grill festival. She's also busy behind the scenes of RTÉ's What Are You Eating? series. Ireland's first female chef to secure a Michelin star (2015) and Ireland's Best Chef (2016 and 2017), Barry has recently departed from Deane's Eipic in Belfast and partnered with Cristina and Stevie Higginson to reopen Clenaghans Restaurant in Moira, Co Down. Expect the same focus on local produce and big flavours minus the fine-dining fuss. Co-founders of the beloved Ballymaloe Cookery School and inspiring Litfest, this sibling pair of cooks and cookery writers share a boundless energy and exceptional food knowledge. Darina has long been a household name, but her brother has been winning hearts of late with his TV series How To Cook Well. Scientists are only beginning to unravel the secrets of gut health and discover just how central our micro biome is to our general health. Author of The Cultured Club: Fabulous, Funky Fermentation Recipes, Dearbhla Reynolds is Ireland's leading fermentation expert and a convincing advocate of how this skill can become a potent key to a well-balanced modern diet. Serial restaurateur Elaine Murphy and executive chef Ian Connolly are behind one of Dublin's most impressive collections of eateries, including The Winding Stair, The Woollen Mills, The Yarn pizzeria, The Washerwoman and now The Legal Eagle gastropub. Their generous approach to food translates into hearty menus and fastidious sourcing. There's an embarrassment of food and hospitality awards in Ireland today, but Georgina Campbell's independently assessed Awards for Excellence are the original of the species. They're based on the best of that year's Georgina Campbell Guide recommendations, all of which are the result of anonymous visits by an experienced assessment team who pay their way like any other customer. Resident chef of RTÉ's What Are You Eating? ; executive chef of 3FE's coffee-fuelled empire, with an exciting new food project on Pearse Street in the pipeline; founder of Athrú, which aims to tackle gender balance in restaurants; and the legend who catered for LCD Soundsystem's Dublin gigs - Hilary is one busy and influential lady. There's an honesty to New Zealand-born chef Jess Murphy that comes from being raised by a hard-working farming family and that infiltrates everything she does. At Galway's award-winning Kai, which she owns and runs with husband David, her seasonal ingredient-led cooking is straight-up and gutsy. The husband and wife behind the McKenna Guides have been dedicated champions of Ireland's emerging food scene for decades. Inclusion in their '100 Best' lists remain one of the highest honours in the industry here, but recently the couple have made a significant contribution to Irish food with the Theatre of Food at Electric Picnic. It's hard to know where chef, serial restaurateur (of Aniar, Eat at Massimo's, Cava Bodega and now Tartare wine bar), food writer, academic researcher and founder of Galway's Food on the Edge gets the energy to achieve all he does, but you can bet his wife and business partner Drigin Gaffey has a lot to do with it. What kind of a vegan eats offal? Well maybe the kind that frequents Assassination Custard, Ken and Gwen's utterly original Dublin 8 cafe where most of the daily dishes tend to be plant-based and some as carnivorous as you'll get. 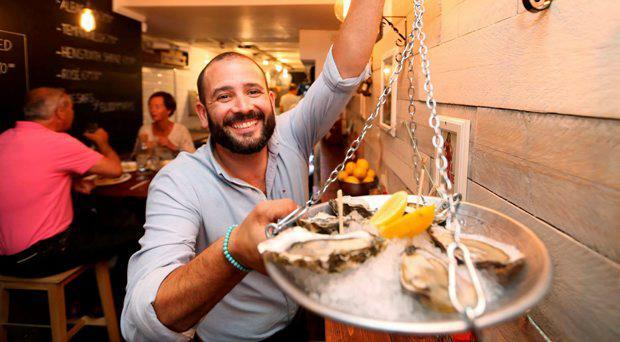 Chef-owner of the expanding Klaw empire, Niall Sabongi is putting the fun back into local seafood. You can sample oysters at Temple Bar's Klaw Crabshack, Hawaiian-inspired poké at Capel Street's Klaw Poké or classic fish pies at his soon-to-open Klaw Seafood Cafe. Watch out for next year's Klaw Urban Mongers on George's Street. Described as the nicest man in Irish food, Neven Maguire has become one of Ireland's best loved food heroes through an endearing blend of humble charm and hard graft, paired with real talent and a generous instinct for championing the best of local producers. The pair continue to grow their impressive suite of almost 30 Dublin-based hotels, bars, restaurants, venues and nightclubs. Having helped redefine cocktails with Vintage Cocktail Club and Peruke & Periwig, they have brought new life to the quayside Dollard Printworks Building with Roberta's bar and restaurant, Tomahawk steakhouse and Dollard & Co food hall. With over 200,000 Instagram followers, model-turned-cookery writer Roz Purcell is Ireland's poster girl for whole-food-loving millennials. Having proved her cooking prowess on Celebrity Come Dine With Me in 2012, Roz's naturalbornfeeder.com blog transformed into a best-selling cookbook of the same name, promptly followed by this year's Half Hour Hero. Ever since journalist and broadcaster Suzanne Campbell co-wrote Basketcase: What's Happening To Ireland's Food? with her broadcaster husband Phillip Boucher-Hayes in 2009, the pair have remained two of the most important, well-informed voices in Irish food, especially in their work together on RTE's eye-opening What Are You Eating? series. There's a Japanese food revolution in Ireland taking place as chef Takashi Miyazaki has been busy winning fans with his regular collaborative pop-ups around the country. One to watch. As Chair of Slow Food Dublin, food writer Dee Laffan is one of the organisers of the inaugural Slow In The City festival (11am-6pm, October 29, Sophia's of Dublin 8). Through talks, demos, tastings, and workshops, the festival will shine a light on food waste and the health of Irish soil.